I cannot believe that today is the first day of February and that we have the first month of 2016 in the books!! January flew by- it was a really busy, but a really fun month!! My New Years Resolution for 2015 was to connect with friends- really put in time and effort to work on my friendships. I was actually able to follow through with this resolution- connecting with at least two friends each month, and they were friends that I had gone at least 3 months without seeing. While it was fantastic to build and strengthen my friendships, and I enjoyed the time I spent with friends, I realized that I really missed socializing with a group of friends. So, my resolution for 2016 is to have one social outing a month with a group (3+) of friends. In January, myself and 10 friends did a Paint Nite!! This was something we planned back in December and I had been looking forward to for weeks! What's Paint Nite? It's a company that hosts a night out at a local bar with an artist. The artist instructs everyone on how to paint a picture. We started out with a blank canvas, two paint paint brushes, paint, a cup of water and a paper towel. Everyone paints the same pictures with step by step instructions from the artist. 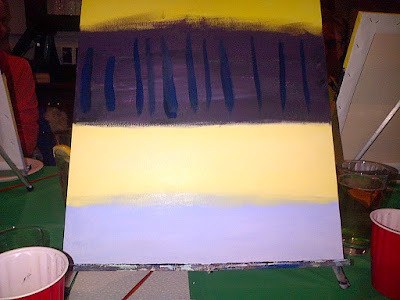 He told us what paint colours to blend in order to make a new colour and where to paint on the canvas. 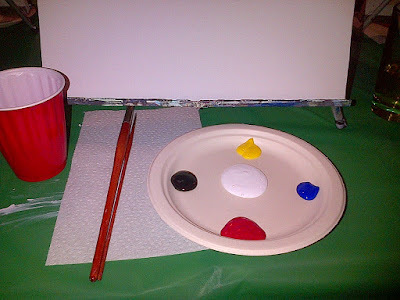 While you are painting, since you`re at a bar, you can also drink and eat. Of course, there is time for socializing. Our group was spread over two side by side tables, so we were all able to talk and interact with each other. There was a lot of laughing going on. At the end of the night, we all had the same painting and had a fantastic time!! 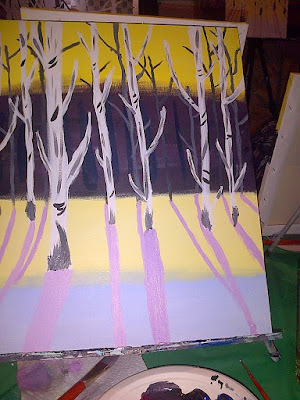 We all agreed that we would love to go back and do another Paint Nite, which I believe we will do. We already have any outing planned for February, which should be a lot of fun too. The finished painting. It didn't turn out too bad!! It's currently hanging in my dad's office. If you are looking for something fun to do, I highly recommend a Paint Nite!! There were groups of friends, individuals and even people on dates. Everyone really enjoyed themselves!! I am 1/1 for this year's resolution and I'm hoping I will be able to stick to it. We already have something planned for February...here's hoping this is something I can stick with for the year! !